Solid Iron Platter - Precision-manufactured iron platter produces uniform inertial mass for perfect stability and rotation. Brings high-fidelity playback to the next level! Adjustable Counterweight & Anti-Skating Force - Essential for any serious classic turntable. 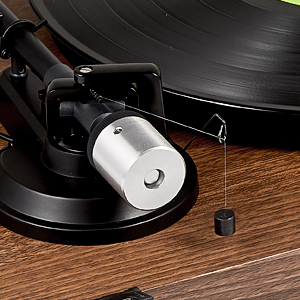 Tonearm counterweight coupled with the advanced anti-skating system produces smooth stylus movement and tunes out skipping and distortion. Great Connectivity - Built-in switchable phono line and pre-amplifier allow connection to the set of included speakers or to your own externally-powered speakers via the included dual RCA output cables. Vinyl Recording Via PC - Connect this turntable to your computer via USB and encode vinyl audio into MP3s for digitalized storage and playback on your computer, smartphone or tablet. 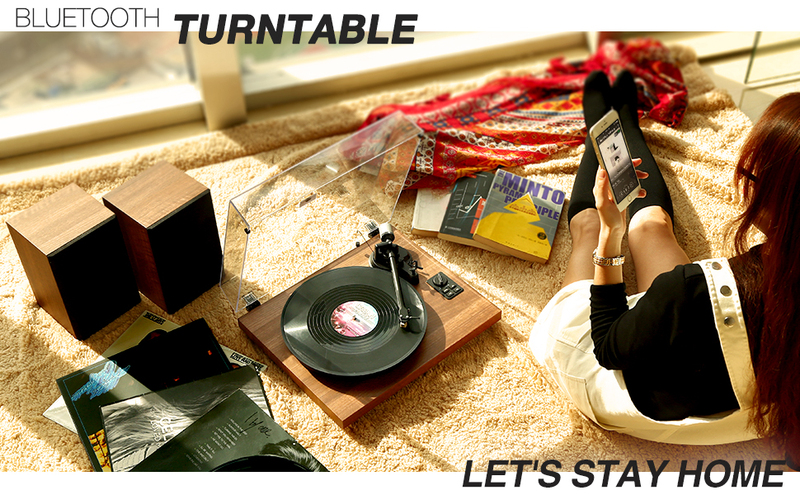 Bluetooth Streaming - Play music from all your favorite devices (iPhones, Android Smartphones, Tablets, PCs, USB-MP3 Players) through the turntable’s speakers with Bluetooth. Inspired by over 100 years of turntable design, 1byone has crafted a fashionable turntable that combines classic mechanics and premium mahogany materials with forward-looking tech features to deliver a truly nostalgic, high-quality and next-level music experience to your home. 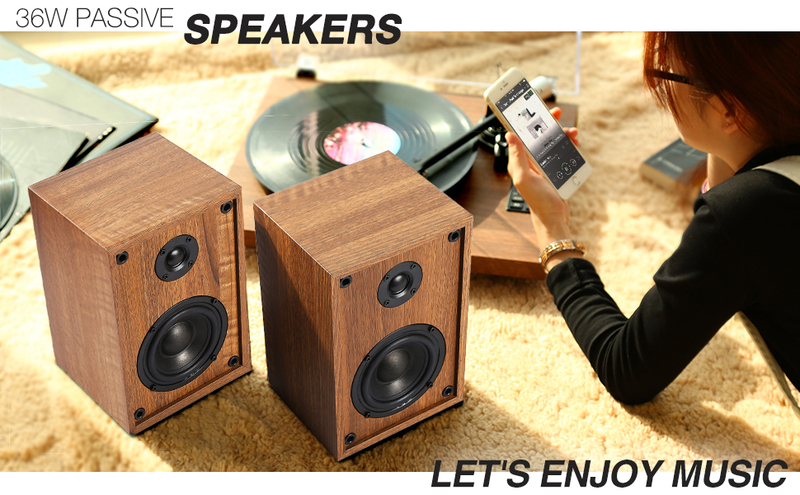 Whether you're savoring the warm sound of vinyl or streaming digital music via the built-in Bluetooth receiver, the included stereo speakers offer crisp, loud sound with 36 total watts of power to get the party started! An AUX output and included RCA cable allows you to connect this turntable into an existing audio system to best maintain your preferred home listening experience. 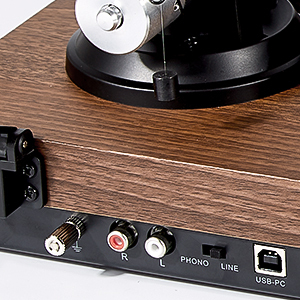 Indispensable to any classic turntable experience, take control of your analog audio with adjustable counterweight and anti-skating force. 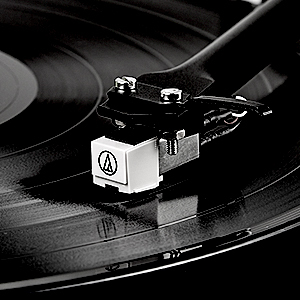 These tools combine to prevent scratches to the vinyl by ensuring the stylus sits perfectly inside the record’s groove, keeping clarity on musical peaks and channel balances and providing freedom from noise and distortion. The moving magnet cartridge is pre-mounted and aligned at the factory, with a built-in amplifier to stabilize all audio. I’d like a model with adjustable counterweight for the arm. Does this one have? Yes, you can adjust the counterweight and anti-skating control.